The first NLSC Wishlist was compiled by our founders, Tim, Lutz, and Brien, back in 1997. NBA Live 97 had been out a few months, and the growing online NBA Live community had plenty of ideas about what they wanted to see in NBA Live 98. Today we all have an opportunity to interact with the developers through social media, but in 1997, it was a matter of making contact and establishing a connection with the right people, and sending along a compilation of our feedback. As for the term Wishlist, it’s a common one that obviously doesn’t originate in our community, but it came to be the moniker our founders used for the annual endeavour of submitting suggestions. If you go through our game hubs, you’ll find links to all of the Wishlists that we’ve compiled over the years. The format has remained mostly the same since that first list in 1997. Feedback is grouped into sections of related issues (i.e. gameplay, modes, options and customisation, presentation, and so on), and the most pressing issues and popular requests are featured as Top Wishes. We didn’t submit formal Wishlists for NBA Live 2002 and NBA Live 2003, as we had established the NLSC Forum as a major part of the site and the developers were keeping tabs on it. After NBA Live 2003 however, we decided to emphasise our feedback with an organised list again. The process of compiling our Wishlists is straightforward, but ensuring that they are comprehensive and provide an accurate cross-section of what the community wants can be challenging. It’s always been our aim to properly represent our fellow gamers, but there are times when we’ve had to exercise editorial discretion. Wishes that are unpopular due to being bizarre or counter-productive are cut, along with any rude remarks. In the early days, online gamers were usually a minority, so unless they spoke up, it was difficult to account for issues that were unique to their preferred method of play. As a community, though, we compiled some great feedback. Needless to say, not all of our wishes were granted, and as I noted, that has led to a certain amount of scepticism over the years. A lot of basketball gamers do question the point of Wishlists, and it’s understandable when certain issues persist through several releases. As I said though, I do honestly believe that we have had a positive impact with our Wishlists, with changes and features we’ve wanted to see making their way into the games. It’s difficult to say with complete accuracy that a particular change was made because of a Wishlist, but I would suggest that speaking up about what we want to see has given developers an idea of what needs to be done. 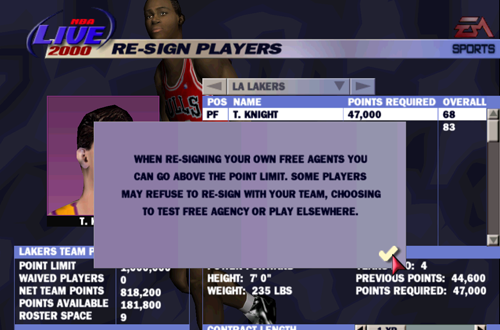 Glancing back at the NBA Live 98 Wishlist, I can see suggestions that have come to fruition in subsequent games. Not all of these features have remained through to the recent games, but in-game saves, saving replays, online play, expanded player bio data, referees, various presentation and atmosphere elements, signature moves, deeper controls, player awards, multi-season play, All-Star Weekend, and more roster editing options, to name but a few, would all come to be implemented at some point. Some of those features would be added as soon as NBA Live 98 itself, while others made their debut as time and technological advancements facilitated them. Again, it’s difficult to say how much responsibility can be ascribed to our Wishlists, as some of these ideas were no doubt being discussed by the developers, and on the roadmap for future titles. Specific details of our Wishlists would come to be addressed and implemented, though. 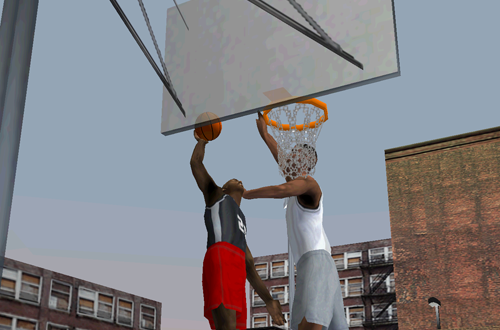 In the wake of NBA Live 2003 feeling too arcade-like and silly, our NBA Live 2004 Wishlist had a heavy focus on making both the gameplay and atmosphere more realistic. 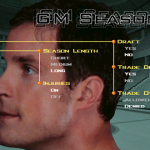 EA heeded that feedback, and several suggestions for the franchise experience also made their way into the newly revamped Dynasty mode. Gameplay sliders – one of the most desired Wishes – were also implemented. Certain features have taken longer to make their way into the games, and in the case of recent NBA Live titles, there are some basic staples that unfortunately remain missing despite our enthusiastic feedback. All the same, I would suggest that past additions that were once Wishlist mainstays – including features that were patched in, such as roster editing in NBA Live 18 – demonstrate that there is value in Wishlists. Putting ideas out there gives them a chance of being read and taken into consideration by the developers, and if nothing else, they’re fun to discuss. Once again, if our ideas remain in our heads, we can guarantee that they won’t have any impact. Looking back at some of the suggestions that seemed like pipe dreams twenty years ago, but are now featured in NBA Live and/or NBA 2K in some form, I’m reminded of just how far basketball video games have come. It also demonstrates that fostering a relationship with the people working on the games has been beneficial, allowing us to make suggestions and offer feedback that will be heard and can be put to use. In the years since the heyday of NBA Live, we’ve also come to cover other games including the NBA 2K series, and so compile Wishlists for the team at Visual Concepts as well. Similar efforts are made over at Operation Sports, as well as on Reddit and Twitter. As long as the developers are willing to listen, the Wishlists are something that we will continue to compile on an annual basis. The benefits of compiling constructive feedback far outweigh any possible drawbacks, and I like that they provide a snapshot of how basketball games have developed and improved over the years (and indeed, decades). So much of that original NBA Live 98 Wishlist has come to be a part of the experience on the virtual hardwood, with some ideas that were ahead of their time. I’m proud that the NLSC has been able to have an impact through our Wishlists, and aim to do the best job I can in curating future lists.